Welcome to the Bacon Revue. It has been a long time since we have opened the curtains and showcased some bacon. 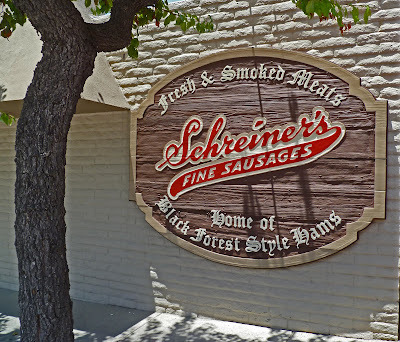 Today’s act,’ Schreiners Fine Sausages’ comes from Glendale in ‘So-Cal’. We visited this fine establishment while on our journey to Harry Soo’s barbeque class. 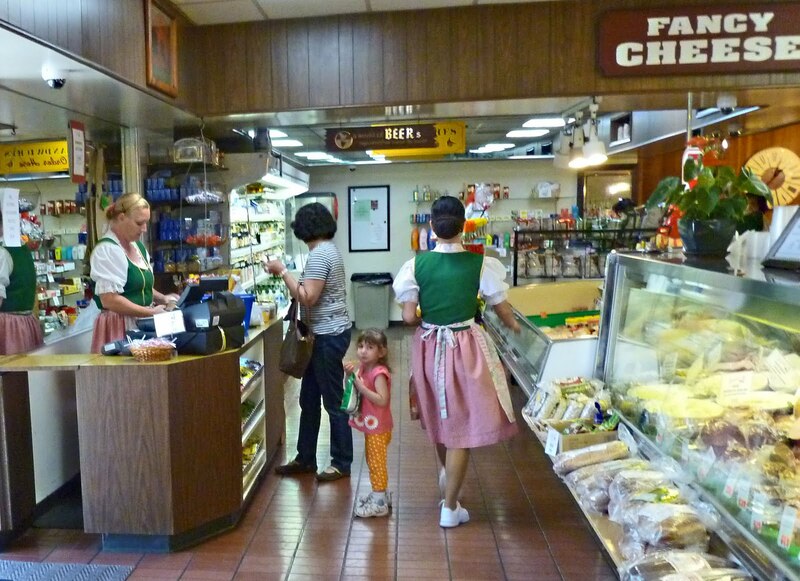 This meat market has been smoking and curing its fine meat products since 1952. Schreiners is a colorful and festive establishment. The female employees all dress in dirndls, the traditional dresses worn in Austria and southern Germany. 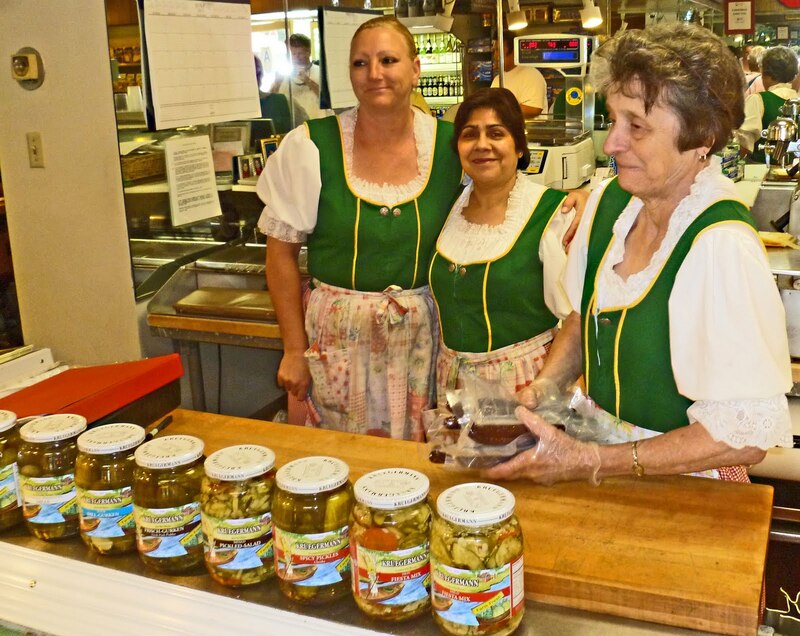 Schreiners Fines Sausages is a well stocked meat market and delicatessen. It was quit popular with people buying sandwiches during our visit. 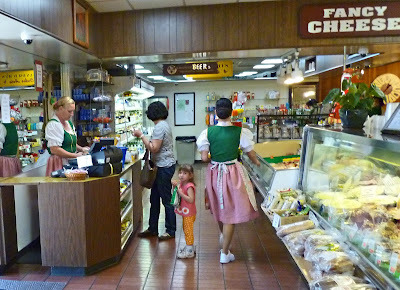 The employees are more than welcome to give you samples of all the various cured meat delights. Knockwurst, Bratwurst, hams, bacon's, so many different sausages, and fresh meats, but today our show is about the bacon. 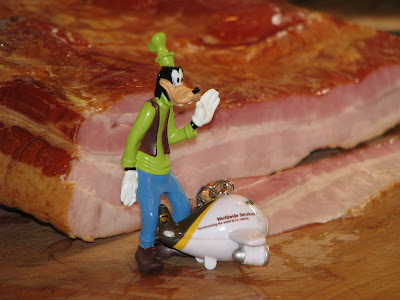 The bacon was packaged in shrink-wrap for traveling. Once the slab was freed from its protective case a beautiful smoky aroma emerged to tease our taste buds. This was a beautiful looking slab. The meat to fat ratio was even. No rind is always a plus in my book. The bacon sizzled and popped as the show required. This was a good balanced piece of pork belly. Salt and sugar were present but not overpowering. The smoke was a complimenting component. It is always about the balance. This bacon is solid all the way around. 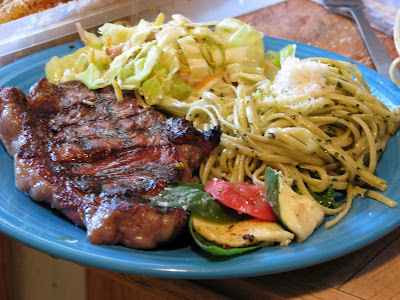 Some cooked slices and left over fat was used in our ‘Warm Bacon Coleslaw” recipe listed below. Combine cabbage, carrots, onions in a bowl . In the skillet that you cooked your bacon, add mustard, olive oil, vinegar and reserved bacon, sugar, salt & pepper. Heat till very hot. Remove from heat and stir into cabbage mixture. Top with chopped bacon pieces and serve immediately. Cabbage and bacon are two great ingredients alone but when they are combined they are a star on the stage of the Bacon Revue. This was served as a side dish to our grilled steak. I hope you enjoyed the ‘Bacon Revue” today. If you plan to visit ‘So-Cal’ be sure to visit Schreiners. You will want to bring an empty ice chest for all your meat finds. Today’s bacon was well balanced in all the right flavor components and will receive 4 stars out of 5. Where: 3417 Ocean View Blvd. Wow... that is a plate of food! Bacon in coleslaw I will be making that. Me like your coleslaw recipe. Whoops, time to cure me some more belly. Greg, This may even be health food. The cabbage counters the bacon fat. cookiecrumb, I am going to by a belly next month from a pig farmer in Woodland. Hopefuly the tomato's will be ready.